I have a lot of people ask me how I can live with so much white in a house full of kids. Well, the answer is, slipcovers. 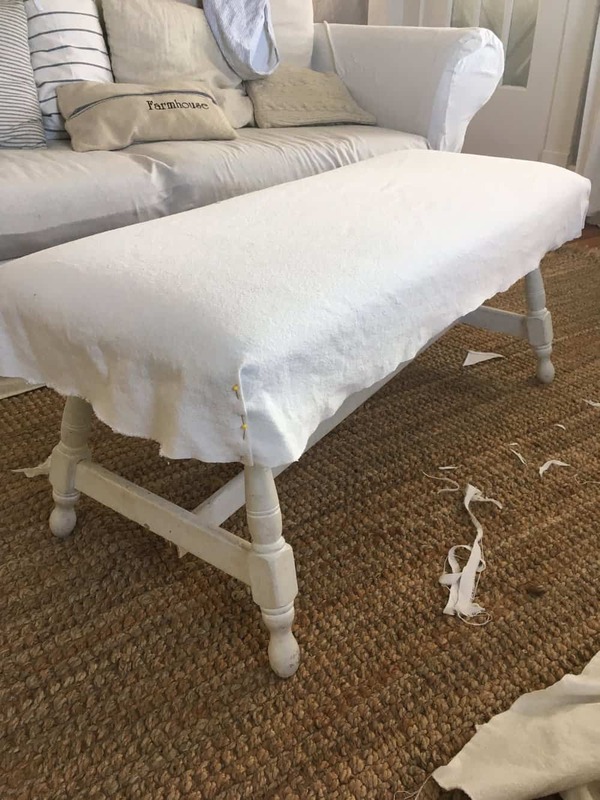 Slipcovers can be removed and thrown in the wash.
My kids get the furniture really really dirty. Anything that is not removable might as well be disposable. Case in point….the before picture of this bench. A couple years ago I picked up this bench for $20 on Craigslist. It was covered with pink butterfly fabric. 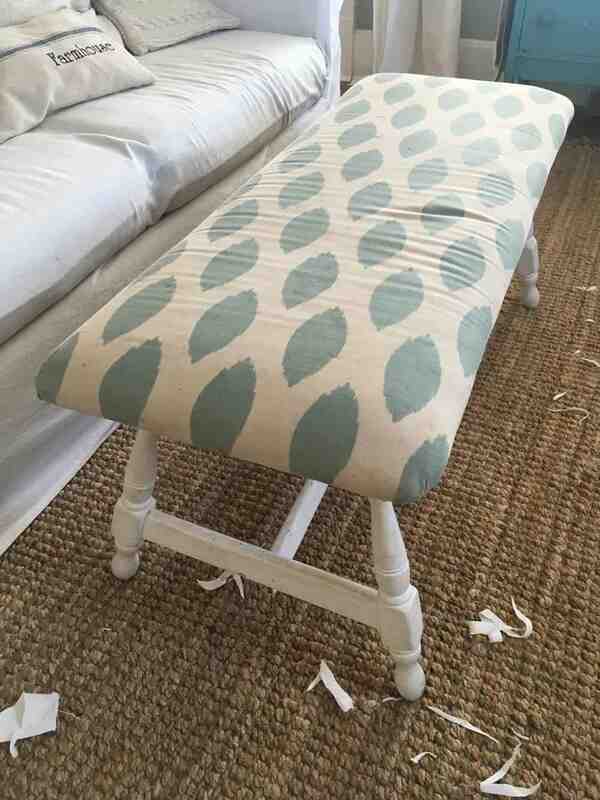 I reupholstered it with this cream and teal fabric. And it stayed looking pretty for all of a few months. I tried spot cleaning it with oxyclean, but when something can’t be thrown in the wash, it just stays looking dingy. The only reason I have held onto it this long is we still haven’t gotten around to building a coffee table for this space, and it kind of served that purpose for now. Well, now I love it again. 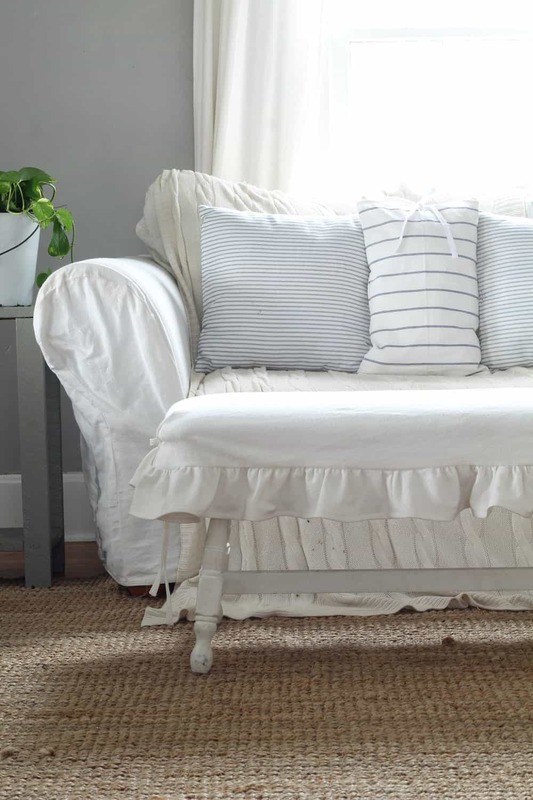 And all it took was a simple slipcover made with bleached drop cloth. Now, please keep in mind with this tutorial that I did not think through adding the ties until later, so some things needed to be readjusted. I will walk you through it so you can avoid my mistakes, but bear with me. So, first, I just draped a piece of bleached drop cloth over my bench and trimmed it until I had the right size. I wanted it to hang about four inches down, so I would have plenty of material to attach the ruffle to. I just kept trimming it until it looked even all the way around. You can see how precise I am with my measurements. I pinned it with a fold in all four corners until it fit snugly. Now, this is the step I would have done differently if I had known I was going to add the ties. See how the fold faces outward. Well I wanted them to both face inward, so I could sew the ties into the folds. You will see how I corrected this mistake later. 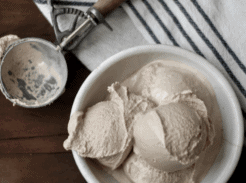 It was a cinch, but if you are making this, just do it right from the beginning. Side note: Most of my DIYs go like this. They are a trial and error process and I almost never get it right on the first try. 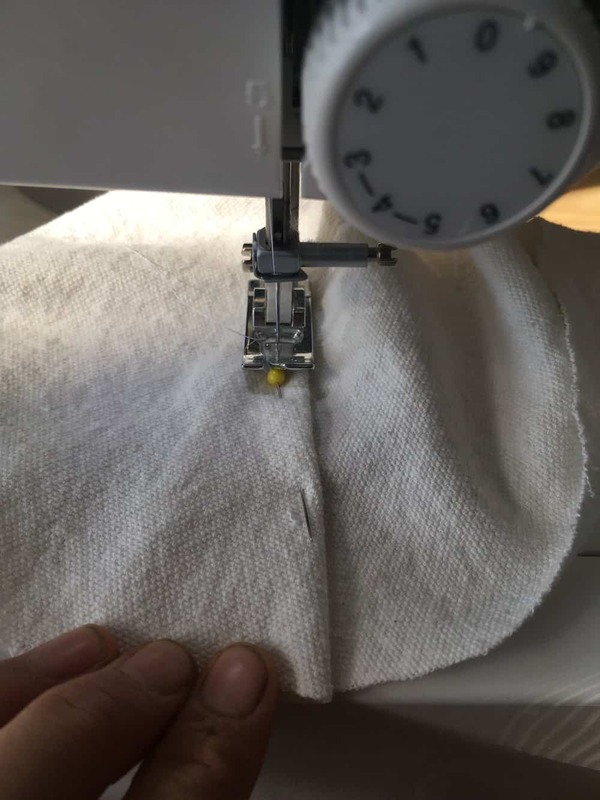 Next, I sewed my folds on all four sides down. This is the part where you should sew your ties in, and not later when I did it! I folded them in half and sewed all the way down. 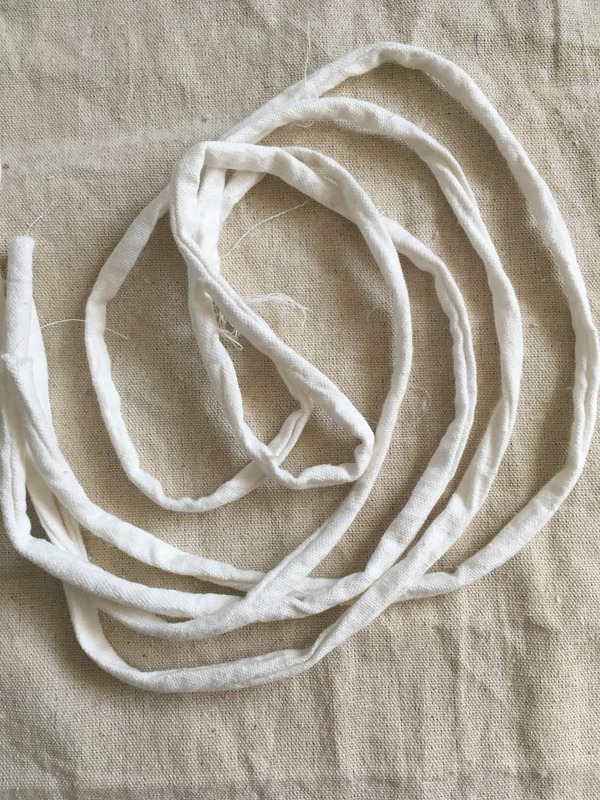 I then pressed them flat and top stitched all the way around, folding the ends under to hide the raw edges. After I finished them, I cut them both in half, so I ended up with four ties each 30″ long. Next, I cut out my ruffle pieces. I made them 6″ wide, but the length will depend on the size of your bench. 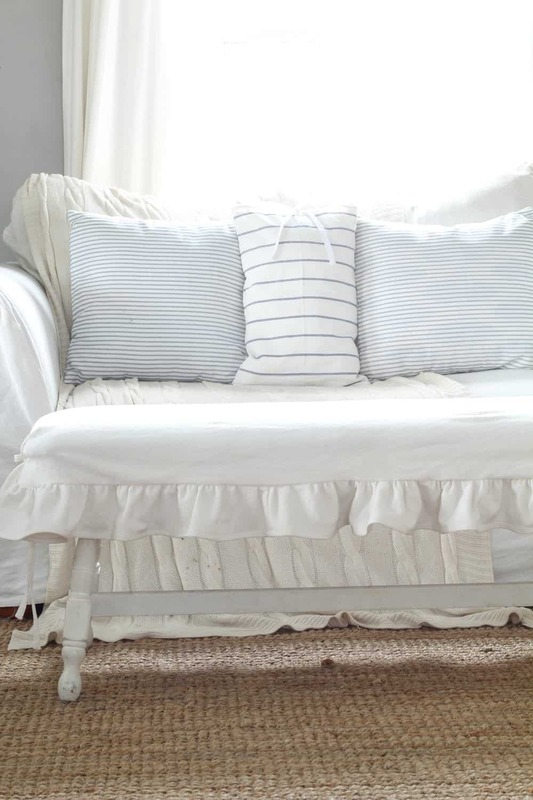 So, if the diameter of your slipcover all the way around is 180″ your ruffle piece will need to be 270″ long. I did not actually have a piece of drop cloth that long so I sewed several sections together. I put a gathering stitch in all the way down and then pinned my ruffle piece to my main slipcover piece. 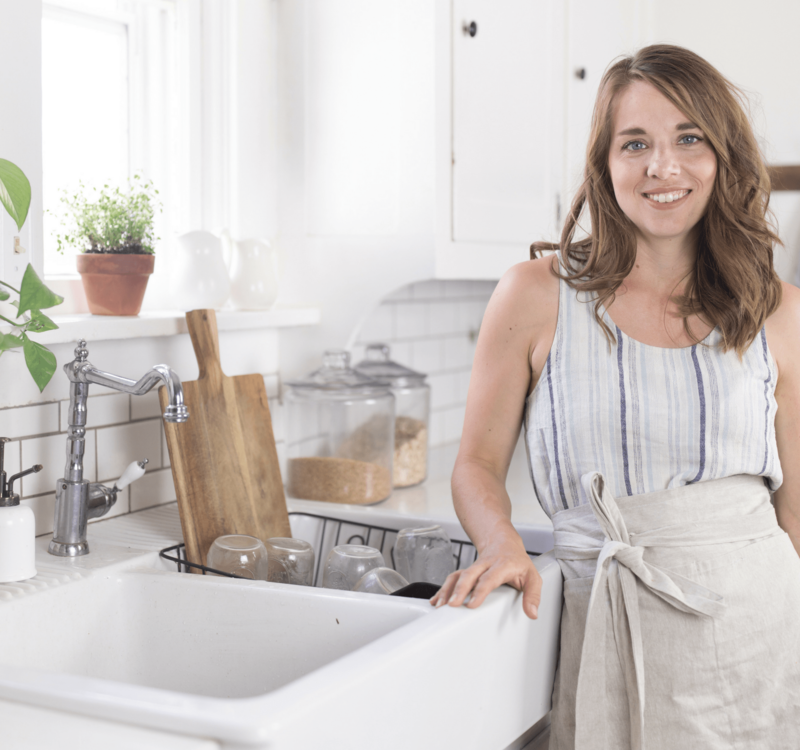 For more details on making ruffles, if you are a beginner, see THIS VIDEO. I brought it back to the bench and readjusted to add the ties. I just ripped out the seams and pinned them back in the right way, with the ties. I stitched the ties in. Next, I serged all the way around the bottom of the ruffle to finish the edge and hide any loose strings. 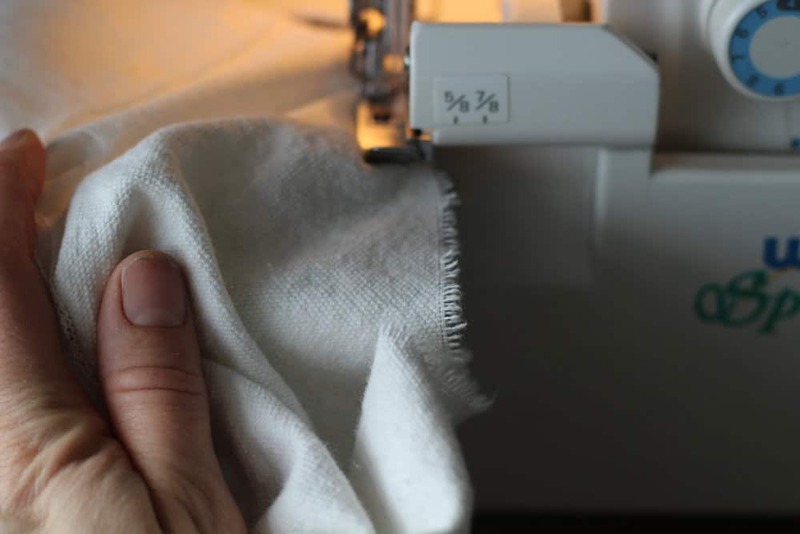 If you don’t have a serger you have two options. 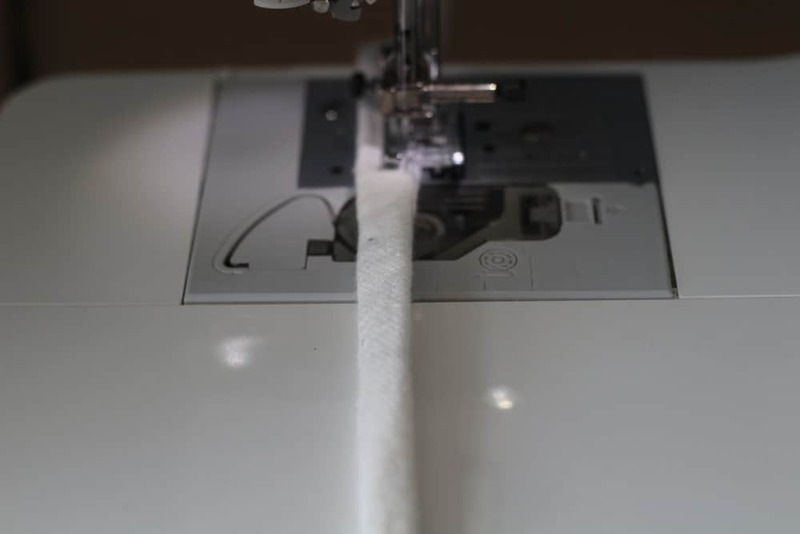 You can either use a zigzag stitch, or any other finishing type stitch your machine offers. 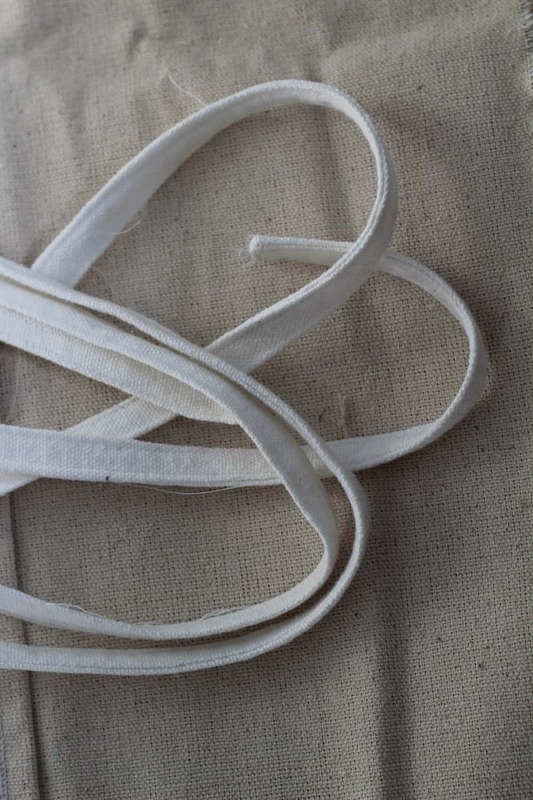 Or you can just hem the edge by pressing it over 1/4″, and then again another 1/4″, to hide the raw edge inside. I didn’t want the hem to be too bulky, so the ruffles wouldn’t lay funny. 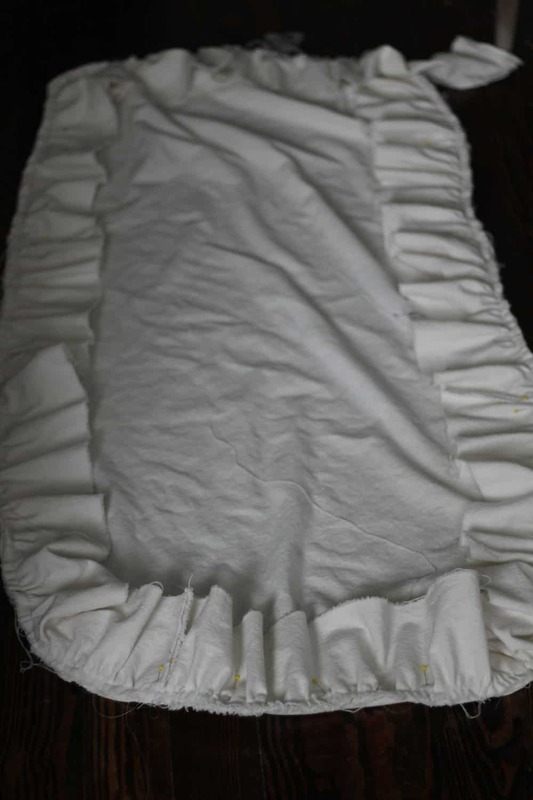 Next, I just folded the serged edge of the ruffle over 1/2″ and sewed it all the around. I brought it back to my bench and tried it on. I hope you enjoyed this tutorial. Let me know if you try it! I just wanted to say that I love this! I also LOVE the way the ties look! 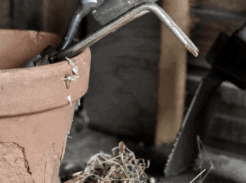 It adds a great deal of farmhouse charm!! Thank you sooo very much for your sweet comment! Oh my gosh! 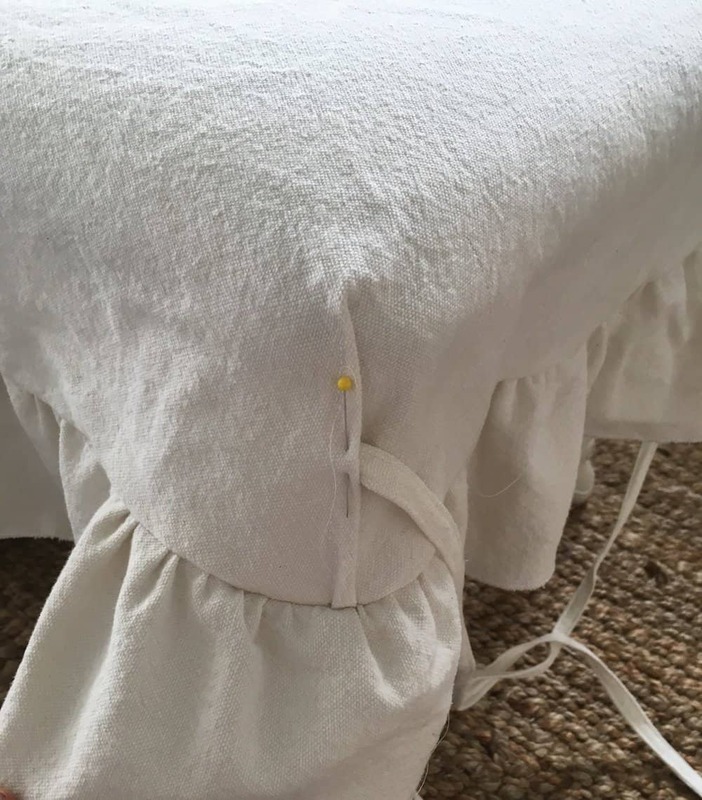 I have wanted to make a cute cover for my piano bench and wasn’t sure the best way to do it…now I know, thanks to you! This is so so sweet. 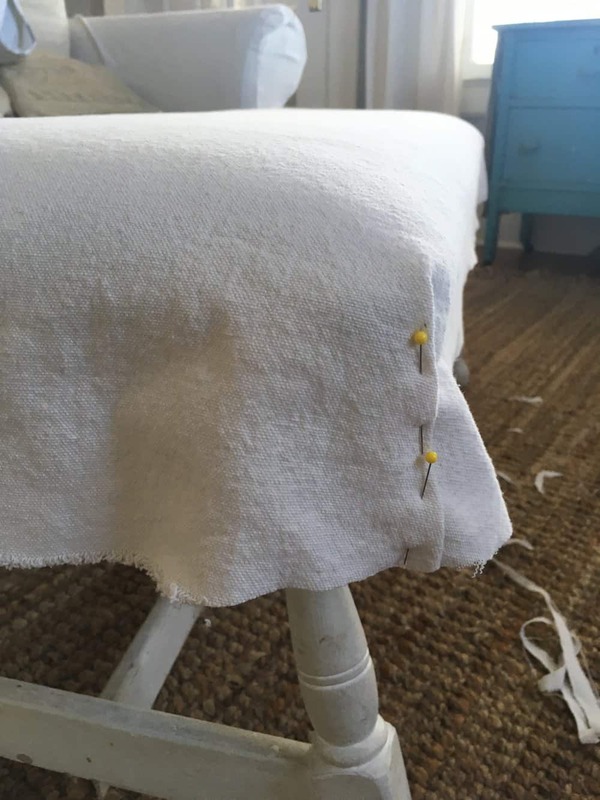 I have a couple benches I could do this with but can you tell me if you preshrunk the drop cloth before you sewed it? I am assuming since it’s 100% cotton it will shrink in the wash. Thanks! Yes! I bleached it, washed and dried it. 🙂 Drop cloth will shrink. Love all ur great ideas and ur home. Love the Farmhouse theme n love my antiques so I mixed them all together. Live in a 1950 home with beautiful original oak floors in South Florida but I’m limited to space. Again thanks Lisa for sharing ur home n ur great ideas. 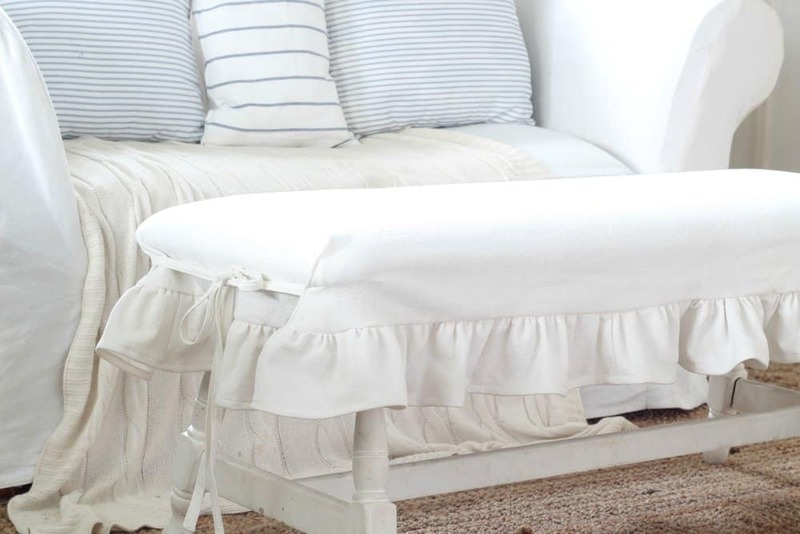 Love the look of your drop cloth slip covers. I went to Amazon website and discovered that drop cloth is £85 in the UK. Sadly not such a bargain!! Oh no! What a bummer!